In the 19th Century, the fictional works of Edgar Allan Poe, Jules Verne and H. G. Wells, along with a whole army of long-forgotten imitators, helped to set the foundations for what in 1926 Hugo Gernsback termed, ‘science fiction’. Their stories usually centred on marvellous machines and devices that could help us explore our world and beyond. As an example, Jules Verne’s 31st novel Robur the Conqueror, starts with sightings throughout the world of strange lights in the sky. 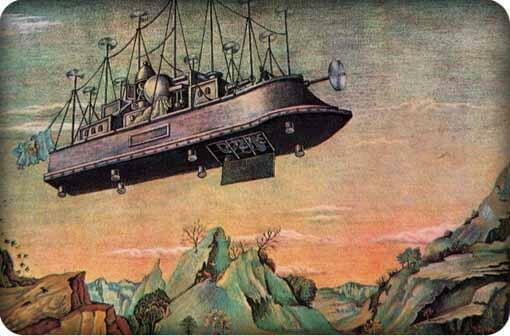 It transpires that these sightings are created by a flying machine invented by Robur. He abducts three sceptics and takes them on a tour of the world, whilst astronomers explain the sightings of this craft as optical and celestial misperceptions. Such a scenario became real in the USA when newspapers throughout 1896 and 1897 reported hundreds of observations of strange objects in the sky and encounters with their inventors. Many of these sightings were probably produced by misidentifications of celestial objects, pranksters sending balloons aloft with lights attached to them or outright journalistic hoaxes. Looking back, we can see these visions in the sky were based on the fiction of Verne and his imitators, the widely-distributed designs of aircraft inventors, and of primitive aircraft being tested in secret. The scientific romances of the nineteenth century and the science fiction of the twentieth century, all displayed a sense of wonder at the possibilities science and technology opened up for the future. The danger presented by aircraft in the early 20th Century dwelt heavily on the minds of politicians and the public. In Britain, the powerful German Zeppelins symbolised the new power of technology to usurp the Royal Navy that had protected these shores from invasion for hundreds of years. Newspapers, magazines, comics, cartoons and plays all featured real and fictional aircraft. A new source of influence, particularly on the working classes, was the cinema. British filmmakers in the 1900s borrowed heavily from the popular literary invasion-scare sub-genre. The image of the airship or aeroplane was a powerful and highly photogenic expression of foreign intrusion. These films included The Airship Destroyer (1909), The Invaders (1909), England Invaded (1909), An Englishman’s Home (1909), If England Were Invaded (1913),Wake Up! (1914), and England’s Menace (1914). It is no surprise that with these images so firmly established in the media that in real life they were used as templates for interpreting anything unusual in the sky. In Britain, numerous sightings of what were regarded as enemy German aircraft were reported in 1909, 1913 and throughout the years of the First World War. The same occurred in other parts of the world where the shadow of the Zeppelin threatened their existence. In our own Flying Saucer Age, any unusual object or light in the sky is now interpreted as an alien spaceship or something equally exotic, or explained away by the sceptics. Now, and in the past, we can see that the media has a powerful role in our beliefs, expectations and perception especially when we are dealing with ambiguous phenomenon in stressful situations. You can read more about this wave of UFO sightings in the book UFOS OF THE FIRST WORLD WAR: PHANTOM AIRSHIPS, BALLOONS, AIRCRAFT AND OTHER MYSTERIOUS AERIAL PHENOMENA – out now.